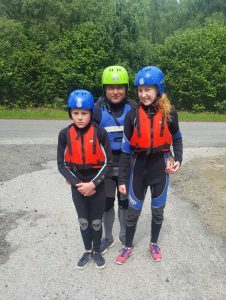 On the 30th of June David and his children came to Splash White Water Rafting to enjoy some river bugging, little did they know that day they would save a wild bird of prey ( We think it was an Osprey but it may have been a Buzzard or an Eagle- if you can identify it from the photos let us know). Bugging is a high adrenaline activity where the client navigates the river and its rapids on a personal inflatable arm chair like floatation device. This great maneuverability allowed David and the guides to take direct action when they seen the bird by the river bank in great distress, its foot tangled in fishing line. As apart of every white water river guides personal safety equipment they carry a knife, our guides James and Pinxo worked diligently with David to free the bird from the fishing line wrapped hazardously around its foot. Today – humankind triumphed 🙂 You never know what you are going to see when you enter the great outdoors, up here in the deep valleys and rolling hills nature is rich and abundant with wildlife. Breathtaking landscapes at every turn and sometimes that wildlife needs our help, it’s great to see folks like David willing to help and give back to our feathered friends. We received this message here at HQ from David’s wife and the attached images as well. Everyday’s an adventure with Splash White Water Rafting. 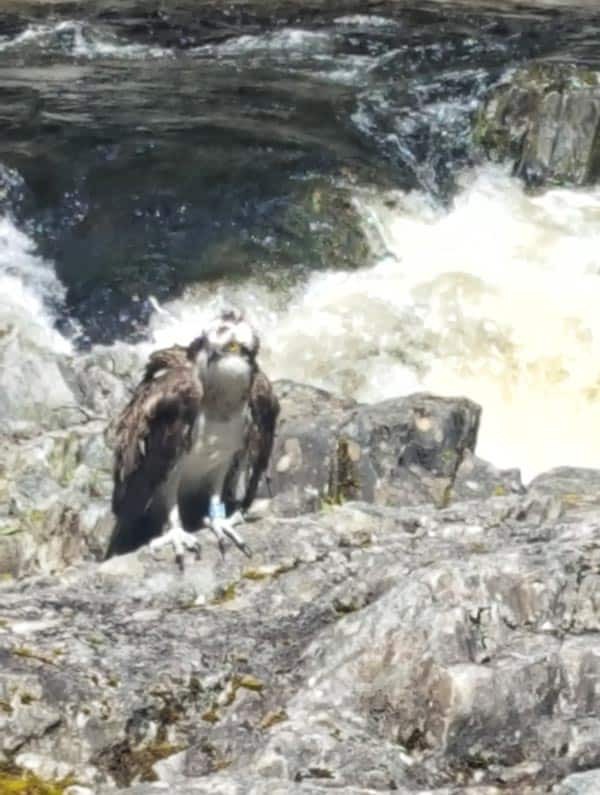 Last week we were on holidays up in Scotland, we were staying in Perthshire where my children and husband did river bugging. 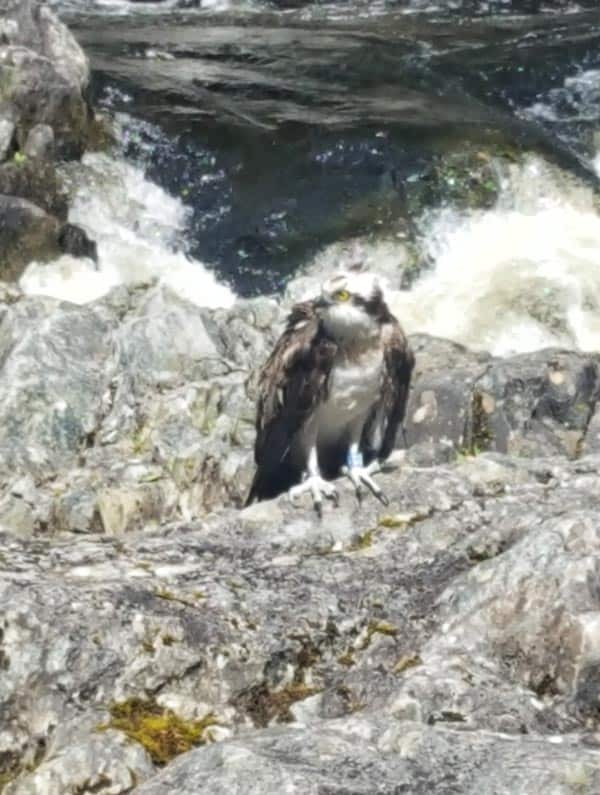 Last Friday when they went down into the river your instructor, I can’t remember his name helped save an eagle that got fishing wire around his foot my husband helped too and they saved him. 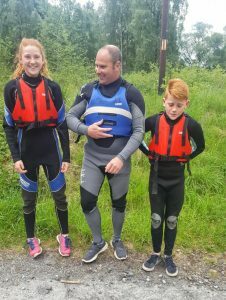 Big thanks to David and his children for choosing splash for their adventure and a big thanks to David’s wife for highlighting our awesome staff and the great deeds of her husband David. 2.Though fish are by far the most important part of the diet, ospreys have been recorded catching a wide variety of other prey, including birds, reptiles and even crustaceans. 3.All British-bred ospreys move south to Africa after the breeding season, with most wintering in Senegal and the Gambia. 4.In Britain collectors exterminated ospreys in the early years of the 20th century, and the birds didn’t return to breed until 1954. 5.Today there are more than 200 breeding pairs in Scotland, and almost all suitable territories are occupied. Photos: Provided and credited to Davids wife.